Parkersburg City Hall is located at 1 Government Square, Parkersburg, WV 26102; phone: 304-424-8400. Photo: George Neal House, ca. 1840, 331 Juliana Street, Parkersburg, WV. Listed on the National Register of Historic Places in 1980. Photographed by User:Nyttend (own work), 2012, [cc0-by-1.0 (creativecommons.org/publicdomain/zero/1.0/deed.en], via Wikimedia Commons, accessed February, 2013. Parkersburg, seat of Wood County, is an industrial and shipping center at the confluence of the Little Kanawha and Ohio Rivers in the northwestern part of the State. The triangular business district, few buildings of which are more than 4 stories high, and the loosely connected residential areas are a result of several periods of rapid and haphazard expansion. These periods followed the coming of highways, discovery of oil and gas nearby, the coming of railroads, and finally the city's industrial development. Although it was one of the five major centers of population and manufacturing in West Virginia, the city proper is spared the usual congestion, smoke, and disorder of an industrial city, for most of the plants are grouped along the Little Kanawha River in an unincorporated section at the southern approach to the city. A few of the plants extend northward along the Ohio River front. In the 30 principal manufactories are produced equipment for oil and gas wells, shovels and garden tools, office furniture, fence and roofing supplies, glassware and novelties, milk bottles, shows, corrugated fiber boxes, iron and steel products, silk yarn, rayon yarn, vitrolite and porcelain & tile products. Three major highways bring a heavy tourist business to Parkersburg each summer and a large volume of rural trade throughout the year. It is the junction of the east-west and north-south lines of the Baltimore & Ohio Railroad in West Virginia and the shipping point for an Ohio Valley farmers co-operative association. The main line of the railroad is carried across the principal business district on a viaduct. The site where Parkersburg stands was once an Indian hunting ground. The first white people to come to this region were possibly French trappers and traders; the first Englishman of who there is any record was Christopher Gist, who passed through here on his expedition to Ohio in 1751. Captain William Crawford and a group of explorers came to the Ohio River in the vicinity of the Little Kanawha River in 1769. The following year George Washington came here to locate lands awarded him by Governor Robert Dinwiddie of Virginia for military service. In his journal Washington tells of leaving the canoes at the mouth of the Little Kanawha River, "intending to meet them at the mouth of the Muskingum River, about 12 miles above the point," and then notes the lay of the land, streams, fertility of the soil and the abundance of game in the region. In 1773 Robert Thornton made a claim for a part of the site of Parkersburg by tomahawk entry, a method of claiming land by notching trees bounding the area with a tomahawk or ax. In 1783 Thornton sold his 1,350 acres to Alexander Parker of Pittsburgh for $50. The land, which is on the north side of the Little Kanawha River and includes "the Point," was not settled immediately by Parker, but in 1785 Captain James Neal, who had surveyed the Parker tract, led a small party of settlers to a site on the south bank about a mile above the mouth of the river. They called the settlement, which included a stockade fort, Neal's Station. Meanwhile, John Stokely built a cabin on the Point and, because of the confused land records of Virginia, obtained a patent on part of the land already claimed by Parker. Following Parker's death in 1880, Stokely successfully contested the claim of Parker's daughter, Mrs. Mary Robinson, and had his title confirmed. Around Stokely's cabin a small community named Stokleyville grew, and in 1801 it was designated the seat of Wood County. Stokely then laid out a town to include both sides of the river and called it Newport, but Parker heirs continued their legal fight and in 1809 regained title to the original tract on the north side. Early settlers came by flatboat, raft, on horseback, and on foot. Most of them were from Tidewater Virginia, though many came from Pennsylvania and Connecticut. An act of the Virginia legislature in 1810 provided for a new town, called Parkersburg, on the north bank of the Little Kanawha and including the older town of Newport. 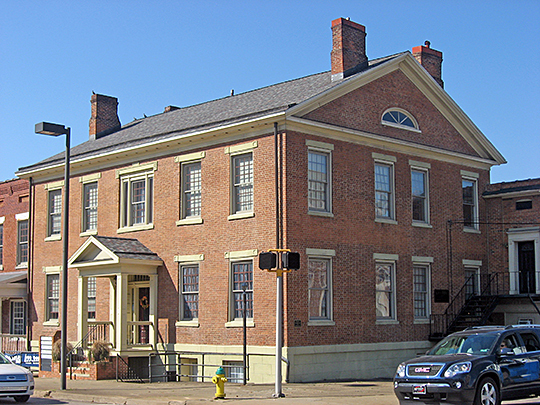 The public square for the courthouse and jail was deeded to the county in 1811 by William Robinson, Jr. Parkersburg received its first boost as a trading center about 1818 when steamboats began to ply regularly up and down the Ohio River. New stores began to appear, dealers in shoes, leather, timber and hides flocked to Petersburg, taverns were erected to meet the demands of travelers, and schools were established. The "Town of Parkersburg" was chartered in 1820. Because of the lack of reads the town's growth lagged, and in 1833 when the first newspaper, the Republican, was established, Parkersburg's population was less than 400. This handicap was partially overcome in 1837 when the Northwestern Turnpike was completed. In 1842 work on a system of locks and dams in the Little Kanawha River was started, and in the following year the second east-west artery, the Staunton-Parkersburg Turnpike, was completed. By 1844 Parkersburg was one of the most important towns on the Ohio River. Its population had grown to 1,400 and it had many taverns, stores, a bank, boatyard, and small industrial plants. In 1857 the Baltimore & Ohio Railroad was completed. The town's first real boom came with the drilling of West Virginia's first oil wells, along the Hughes and Little Kanawha Rivers, in 1859-1860, and the subsequent rapid development of the rich Burning Springs field. In the mad rush for black gold, Parkersburg prospered as the nearest point of supplies and shipment. By 1853, when it was granted a city charter, Parkersburg had a population of more than 3,000, mainly employed in trade with the oil fields and the refining of crude oil. Other than a setback in trade, Parkersburg experienced little hardship from the War between the States, and the town's development resumed when peace was restored. Much of the oil territory in the Little Kanawha Valley was owned by Senator Johnson Newlon Camden, a politician financier, and industrial promoter, who sold his holdings to the Standard Oil Company. With the establishment of the Camden Refinery, Standard Oil and other refineries, the city became the chief source of kerosene for much of the South and West. Parkersburg's development as an industrial city greatly increased after the 1880s, when the rich gas fields east of the city were tapped and industrial plants began using natural gas instead of coal as a manufacturing fuel. After 1900 the oil fever abated, and by 1937 the last oil refinery in Parkersburg had closed, although the manufacture of oil-well equipment continued. Federal Works Agency, Works Progress Administration, West Virginia: A Guide to the Mountain State, American Guide Series, The Conservation Commission of West Virginia, 1941.